Nothing fresh (posted on YouTube, over 1 year ago), but it is one of my favorite videos from a LEGO build (even the music fits just great). The NXT Segway implementation below. It is a creation from Rich (richrobottoughts), which is in fact "just" a copy from Philo's own implementation (NXTway) described here (video also here, but somewhat boring, as Philo wrote...). Rich also wrote about his replica at his RobotThoughts blog. 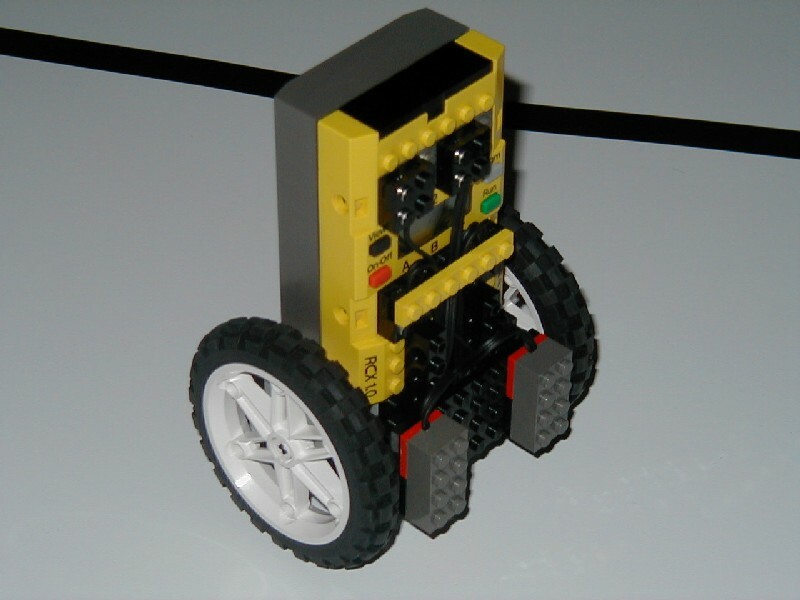 However, the first time the Segway concept was implemented with LEGO, was done by Steve Hassenplug who have used at the time, an RCX programmed with BrickOS (LegOS) to build his LegWay. Read more about and find the program source code here. Later on, a newer implementation (NXTway-G), was built by Ryo Watanabe, using a gyroscopic sensor. Later again, Ryo has modified it to use the HiTechnic NXT Gyro sensor. See it also in action below. Steve Hassenplug's LegWay on the left and Ryo Watanabe's NXTway-G on the right. For the most skilled and if you have some interest in the background mathematics, that made this possible, see the NXTway-G Motion Equation and take an overview about its behavior and how it was done! If you have further interest about Segway and its working principles read all about, at HowStuffWorks. 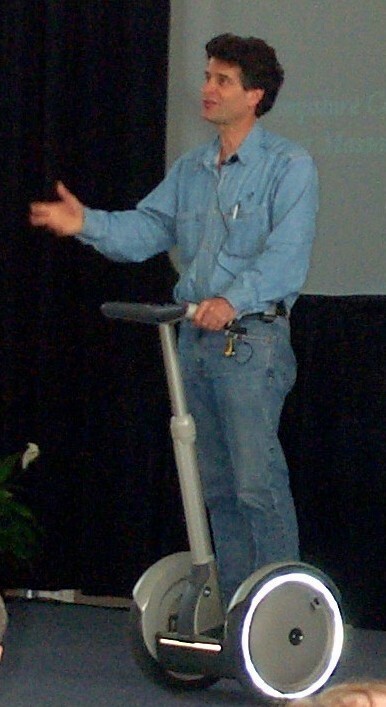 Segway, a two wheeled auto balancing transporter, is an invention from Dean Kamen, who owns DEKA , . DEKA is a small research company whose name is derived from Dean Kamen's name and which mission is to foster innovation. Dean is an inspired inventor with many other high impact inventions in the society with particular emphasis in medicine and auto balancing robots. Among them, you may find: iBOT [1, 2], AutoSyringe®, Luke Arm (presented before at TBs , here) and many other. And because Dean's life also crosses the path of our favorite hobby, in what concerns with LEGO, he is also the founder of FIRST (For Inspiration and Recognition of Science and Technology) , . An organization founded for developing ways to inspire young people in science, engineering and technology fields and lead them into innovation. FIRST organizes many well known competitions like: FIRST Robotics Competition, FIRST LEGO League (aka FLL, maybe the best known among AFOL comunity) [1, 2], Junior FIRST LEGO League and FIRST Tech Challenge. Because of his passionate commitment to FIRST, Dean was awarded with the LEGO Prize this April, by the hands of Kjeld Kirk Kristiansen (Owner and Vice Cairman of LEGO). After 10 years leading FLL, from just a couple of hundred participants to more than 100,000!” says Kjeld Kirk Kristiansen. “FIRST is inspiring the next generation of innovators and engineers,” said Kamen. “Years from now, some of the students who competed in the Georgia Dome will be inventing solutions to society's most challenging problems." Hi, good to see you here also at TBs, Brian! Really cool pic, that one! Ha! If I'm famous, we're all in trouble ;) But yes, I (& a lot of others) check in here for news and updates. The biggest problem with the picture was focus - it was hard to get a reasonable focus on both the Segway & the LEGway at the same time. Both balance remarkably well, it was just the cameraman (me) who had trouble setting up the shot (it turns out the folks concerned with safety didn't really like me laying on the ground in front of Steve driving the Segway... imagine that :) ).